Over the last 3-4 months there has been specific sectors which have outperformed the Index. We had earlier initiated a view Telecom stocks like Idea at 70, Bharti at 360-380.Later the focus shifted to Auto – Bajaj Auto at 1500. 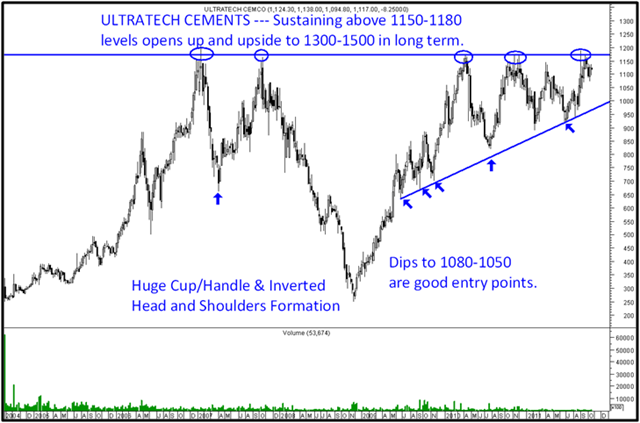 Now it seems Cements will be the next sector to watchout for. We have been maintaining out long call on Cement stocks since last 1-2 months. 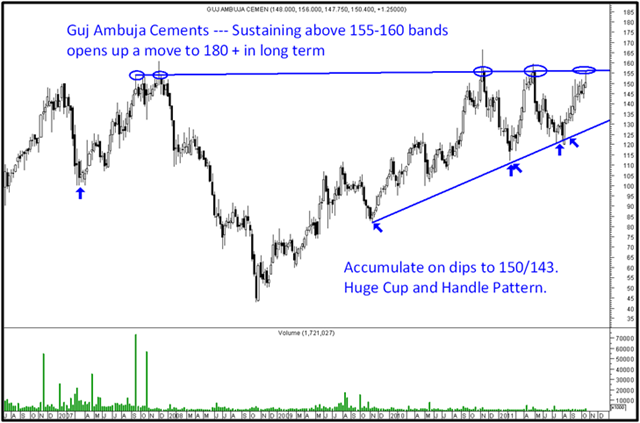 ACC was recommended at 1020 and Guj Ambuja around 130-135. Yesterday had mentioned about ACC. Posting the other two charts which are interesting. Also have been recommending Grasim from lower levels. We are also looking into Midcap/SmallCap Cements. Logically this sector is less affected by Global Concerns. For more details contact Kazim 09821237002, Asif 09833666151.
è The stock is forming a huge Inverted Head and Shoulders which gives a target projection of 1400-1500 + over the long term. è Multiple attempts have been made at the resistance band of 1150-1180 over the last 1 year. Considering the fact that it has attempted 3-4 times already and is making higher bottoms indicates the stock may breakout above 1180 over the next few months. è The stock is trading above all leading moving averages in a market which is trading way below leading moving averages shows relative strength for the stock. è Strong supports are placed at 1050 levels and any dips closer to that should be a point to add more to the stock. 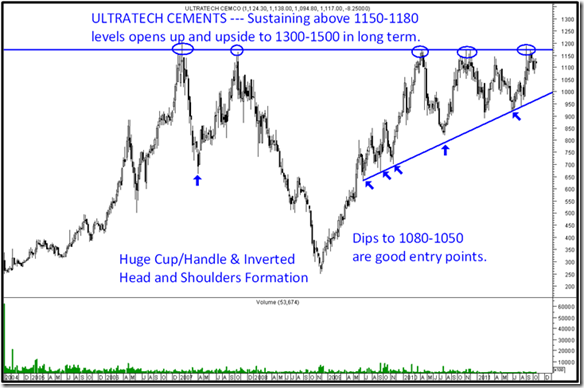 Momentum will be seen in the stock once it starts closing above 1150-1180.
è One can accumulate the stock at 1140/1050 with a closing stoploss of 1010 and a long term target of 1300-1500.
è The stock is forming a huge cup and handle pattern which gives a minimum target implication of 180.
è Multiple attempts have been made at the resistance band of 155-160 over the last 3 years. In the last 1 year it has already made 3-4 attempts at that resistance levels indicates a very high probability of it being taken of and the stock going into uncharted territory. è The stock is trading above all leading moving averages in a market which is trading way below leading moving averages shows relative strength for the stock. So it becomes a very good defensive portfolio pick. è Dips to 150/143 should be used to accumulate with a stoploss of 136 on closing basis and long term target of 180-200. ACC Limited — Looks Interesting for long term. hellow sir good analysis and happy diwali and happy new year. Have a prosperous life a head. sir which moving avg u r using and works accordingly to the price plz reply. Cant disclose the ones we use. But 50 and 200 are the basics. Does Prism Cement look good? I am holding it since over 3 yrs at about 72 levels. It is languishing at 40 levels. I haven’t averaged it. Do you think i should average out at this level to at least get my money back if it goes up from here? Thanks so much for all your valuable responses. Thank you so much Nooresh. Always appreciate your quick response. 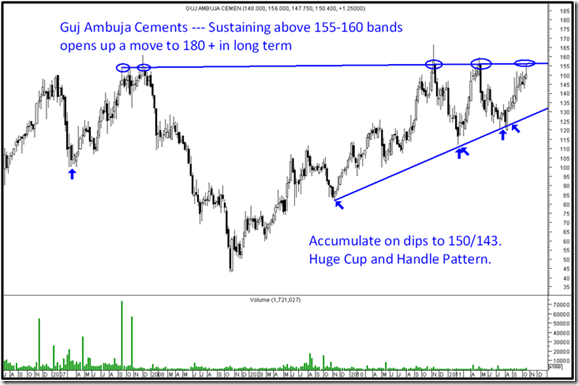 Sir India cements is one more which is one of the largest producers in south india. I already have a holding in it. Do u think i should average it??? ?